Miller's has been making its award-winning banana pepper mustard since 2002. Despite the accolades, a dated look and strategic design flaws made growth difficult. 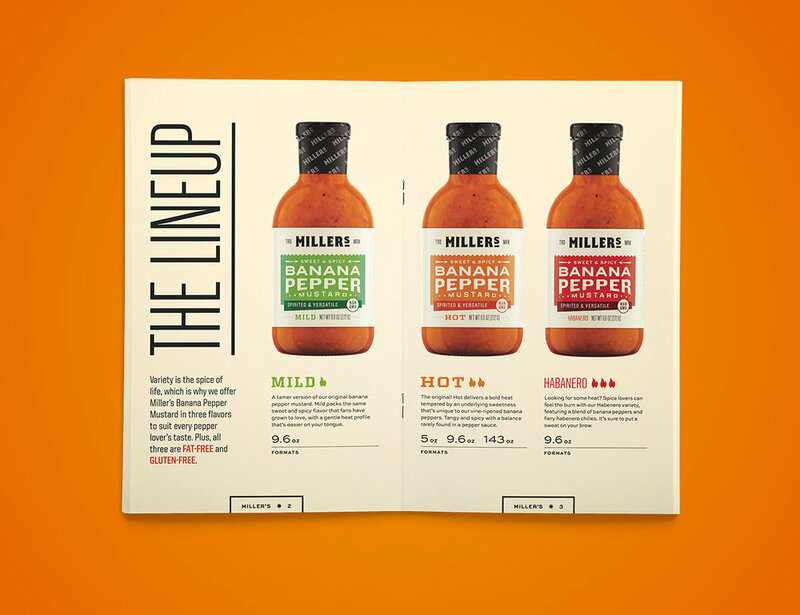 Hampton Hargreaves worked with Miller's to revitalize their brand and reinforce the sauce's unique spirit and versatility, helping it rise above the myriad of spicy condiments. HH began by creating a new logo for Miller's that captures the bold character of their signature product. Inspired by vintage seed packs, its strong forms and angular serifs straddle classic and contemporary styles. With label heights of only 2.5 inches or less, an understated, type-driven design was developed to ensure clarity and impact. Vibrant color fields provide quick flavor recognition. HH also developed new product descriptions and call-outs to provide buyers with some banana pepper education. From stationery to apparel, the mustard's vibrant orange lives beyond the bottle on brand touchpoints. The addition of black and cream provides balance and echos Miller's commitment to simple, natural ingredients. The result is a color palette that's instantly recognizable. Print collateral was designed to help the brand engage new customers. More magazine than catalog, Miller's re-launch brochure provides colorful insights into the farms, ingredients, stories and recipes behind the company and its products. HH also developed a series of new images for use across Miller's marketing pieces. Warm, rustic settings provide a simple backdrop for the brilliant colors and textures of Miller's peppers and recipes. HH also revitalized Miller's online presence with a website designed to quickly connect fans to products. Custom illustrations and photography accompany visitors through the Miller's story as they scroll. The site also includes an easy-to-use store locator and recipe portal allowing Miller's to efficiently update the site as they — and their fans — continue to grow.